For years, the XM855 (*the civilian version of the Military’s M855 penetrator round) has been the go-to offering for shooters looking for the best intermediate grain weight load for the 5.56x45 caliber platform, particularly in the AR-15 and clones. This is a loose packed 1000 round case lot of this very ammunition with a bonus used ammo can out of the famous Lake City facility. 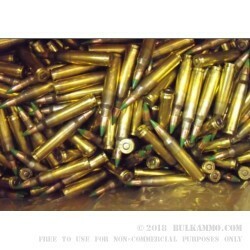 This is a fantastic price on the famous load that functions so well in such a wide variety of firearms. The 62 grain weight offers peak performance out of a wider variety of firearms than most bullet grain weights for the 5.56. it truly hits its stride from about the 1 in 8 inch twist barrels to about the 1 in 10 inch twists, with decent performance in other mainstream twist rates as well. 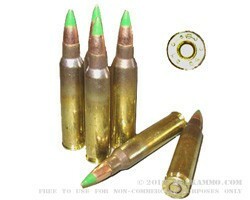 The green tip projectile offers the famous “penetrator” core and while it has come under some regulatory scrutiny by certain agencies over the past decade, it still offers the premium experience for the widest range of activities for the AR-15 and similar platforms. The premium brass and easily reloadable configuration means you are getting a great value add, on a product that while it is worth every bit of premium it commands, is actually already reasonably priced for the broader market. Can't wait to pop some down range!